Various species of this pest are found throughout the United States, though they are more common in the South. Stinkbugs are shield-shaped and may be green, brown, or bluish-gray. They give off an unpleasant odor when crushed. 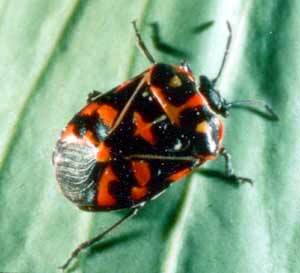 Stinkbugs feed on okra, squash, beans, tomatoes, and a number of other plants by sucking plant juices. New shoots may wilt, and fruits are distorted with hard, dimpled areas. Adults overwinter in garden debris and in nearby weedy areas. There are several generations per year. Spray or dust with approved insecticides. Keep weeds around the garden in control. Clean up the garden at the end of the season. Hand-pick stinkbugs in early morning when they are slow moving.